If you're looking at a map of Ireland, then Athlone Castle will be almost exactly in the very center of it. Found in the Province of Leinster, and the County of Westmeath, the Castle is easy to find thanks to signs leading you to the structure and the adjacent visitor's center. From Dublin Airport, the drive is just under 90 minutes, and the route goes along M4 and M6 until the L4023 exit. Athlone Castle, which was constructed in the 12th century in County Westmeath, is a definite stop for all ages while visiting Westmeath in Ireland. Originally constructed of wood, the castle was apparently destroyed in the late 1100s. The stone structure we see today dates from approximately 1210. Its primary purpose was to defend a key crossing point of the river Athlone. The stone castle was completely refurbished and opened to the public in 2012, bringing history to life. 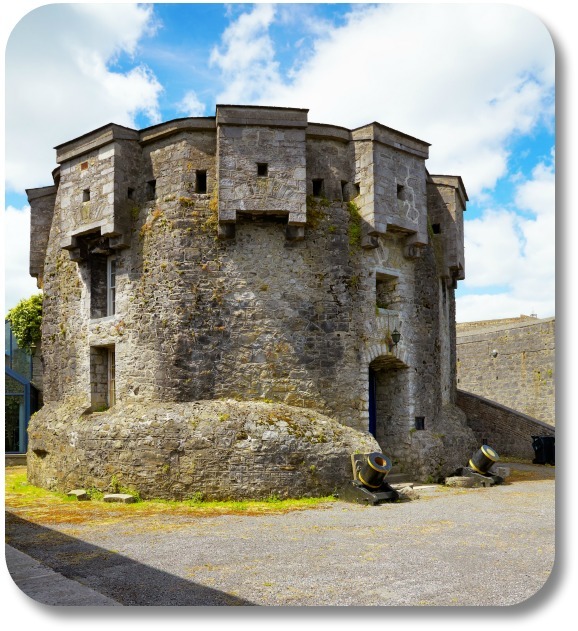 You will love the Athlone Castle Visitor's Center, where you can relive key moments throughout history, such as the siege of Athlone, from the perspective of a castle resident. Don't miss the keep of the castle, which is now an Irish National Monument. Athlone Castle has undergone many changes in its long life. From its wooden origins to a total overhaul in the 15th century, the castle has been altered several times. Some of the biggest changes include supplementary structures added to the castle property. Some of these additions include a guard house, an ablutions room, officers' quarters and a drawbridge. The Castle was built as a protected fortress. Security was always the priority, with any artistic details being afterthoughts. To truly understand the nature of the Castle, you can relive the Siege of Athlone. This battle held in 1691 involved an invading force of more than 25,000 soldiers, and the multi-sensory experience at the visitor's centre lets you experience it firsthand. Also at the Athlone Visitor's Centre are a number of interactive games. Rather than an ordinary museum, these games are appealing to kids and really bring the history of the castle to life. One of the most interesting exhibits at the Athlone Visitor's Centre is called the Fabric of Athlone. This is an amazing collection of local artifacts that show how the castle and Athlone have been shaped over centuries. Of course, life in Castle Athlone was far from easy. The Death and Destruction exhibit reveals the many obstacles and diseases that plagued residents of the castle over time. You might be surprised to learn that this famous Irish castle was originally built for an Englishman. More specifically, the original Athlone Castle was built for King John of England. While guided tours of the Castle are available, this is one time when a self-guided tour might be best. With so many exhibits and attractions, you'll enjoy being able to go through them all at your own pace. If you're looking for more to do after your visit to, head right across the street from the Visitor's Centre to see Luan Gallery. This is a wonderful art gallery with a collection of local Irish and international works. Many of the paintings depict the castle or life in Athlone.